Rose-Marie Swift has been mixing up coconut-oil based luminizers (AKA her famous highlighter), concealers, and other makeup essentials for her cult-favorite brand, RMS Beauty, since 2009—long before the clean beauty movement really had a space in the beauty conversation at large (or many women’s cosmetic bags). Unsurprisingly, the skin-care and wellness guru is riding the wave of beauty trends yet again—and this time, it’s with ingestibles. “I’ve been saying ever since I can remember, ‘The skin is a mirror to your gut,'” Swift tells me. “We can pile on makeup as we please, but if our insides are out of whack, our outsides will reflect it. A healthy gut leads to healthy skin.” And that’s exactly why she created beauty supplements, to help restore balance for a proper glow. 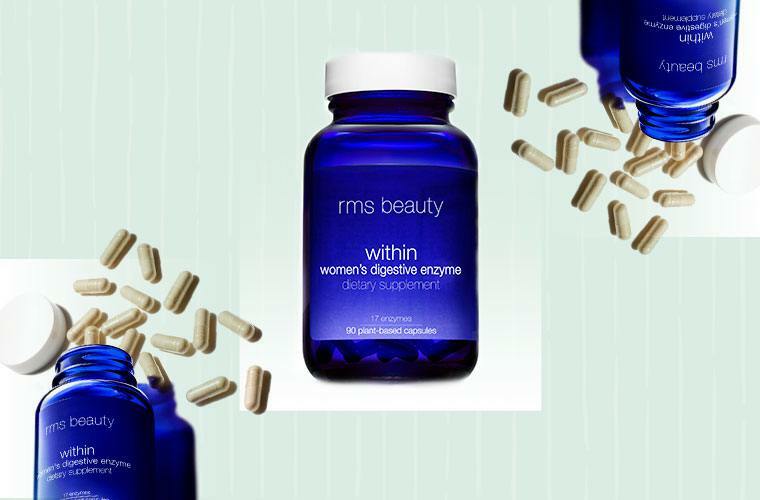 On February 15, RMS launches two new supplements in the line dubbed “Within” (which will be available exclusively at Free People). The first is a women’s digestive enzyme, which is tailored to help women break down food more easily, something Swift explains can help with impacts of aging. The second is a prebiotic-and-probiotic combo, which contains 25 million CFU per serving plus free-radical-fighting antioxidants to promote a healthy immune system and digestive function. While the pair is clearly targeted to help with the gut, your skin consequentially can get a boost too, because your radiance is even more prominent when your insides are functioning properly. “I am excited about the fact that we’ve created two products that can actually contribute to the wellbeing of a woman’s internal system,” she adds. “I hope we’re pioneers in this wellness space, as I think making products that enhance your beauty is more than skin deep.” Beauty’s an inside job, after all. Another key factor in beauty from the inside out is taking collagen—these are all the different types to know. And here are the foods to pair with your collagen to make it more effective.